Cliff™ test leads are semi custom made to order. We can combine any of our components to produce leads to suit most applications. Our lead sets are usually supplied packed in a plastic wallet. All 4mm plugs are shrouded and touchproof. All components conform to IEC 61010. We have three kinds of standard, double-insulated cable, rated 1KV (PVC), 5KV and 12KV (silicone). Available in black, red, green, blue, brown and yellow. See the PDF data sheet: Three-Lead and Two-Lead Test Sets (opens in a new window). CIH29910 Three Lead Set: unfused probes to 90° 4mm plugs including CAT III probe adapters. Blue / Green / Brown . Probe adapter: 1KV CAT III. 1kV CAT II without probe adaptor cap. 1kV CAT III with probe adaptor cap fitted. 1 x blue lead assembly. 1 x green lead assembly. 1 x brown lead assembly. 1 x blue CAT III probe adapter (fitted). 1 x green CAT III probe adapter (fitted). 1 x brown CAT III probe adapter (fitted). See the PDF data sheet: Three-Lead and Two-Lead Test Sets and CIH29910 lead set drawing (these open in a new window). 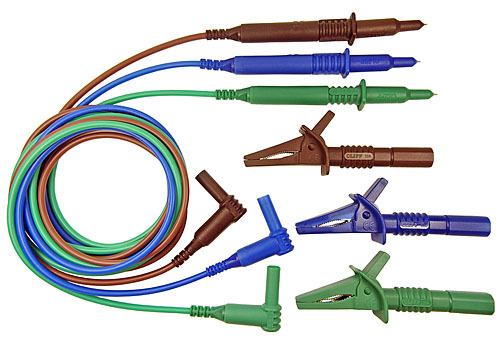 CIH29915 Three Lead Set: unfused probes to 90° 4mm plugs including CAT III probe adapters and push-fit crocodile clips. CIH29905 As above but with a 1.2m cable. Extended push-fit crocodile clip: 10A 1000V CAT II, 600V CAT III. 600V CAT III / 1kV CAT II with crocodile clips fitted. 1 x blue extended push-fit crocodile clip. 1 x green extended push-fit crocodile clip. 1 x brown extended push-fit crocodile clip. See the PDF data sheet: Three-Lead and Two-Lead Test Sets and CIH29915 lead set drawing (these open in a new window). 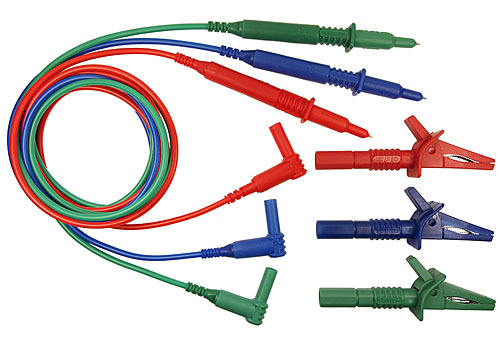 CIH29916 Three Lead Set: unfused probes to 90° 4mm plugs including CAT III probe adapters and push-fit crocodile clips. Red / Black / Green . 1 x red lead assembly. 1 x black lead assembly. 1 x red CAT III probe adapter (fitted). 1 x black CAT III probe adapter (fitted). 1 x red extended push-fit crocodile clip. 1 x black extended push-fit crocodile clip. See the PDF data sheet: Three-Lead and Two-Lead Test Sets and CIH29916 lead set drawing (these open in a new window). 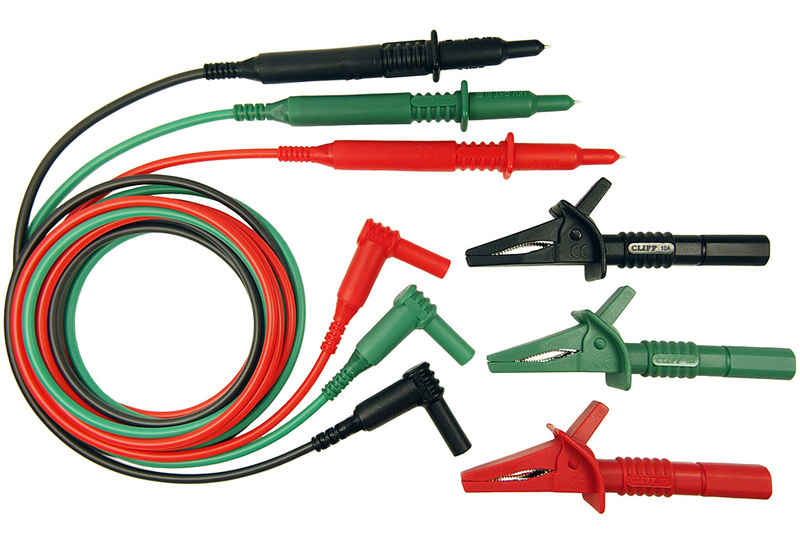 CIH29917 Three Lead Set: unfused probes to 90° 4mm plugs including CAT III probe adapters and push-fit crocodile clips. Blue / Green / Red . See the PDF data sheet: Three-Lead and Two-Lead Test Sets and CIH29917 lead set drawing (these open in a new window). CIH3021 Three Lead Set: fused probes to 90° 4mm plugs including screw-fit crocodile clips. 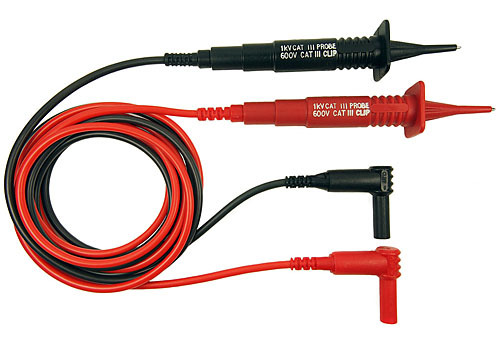 1kV CAT III probe, 600V CAT III clip. Fused: 10A F, 600V HBC 50kA, inline. Screw-fit crocodile clip: 10A 1000V CAT II, 600V CAT III. 1kV CAT III with probe. 600V CAT III with crocodile clips fitted. 1 x red screw-fit crocodile clip. 1 x black screw-fit crocodile clip. 1 x green screw-fit crocodile clip. See the PDF data sheet: Three-Lead and Two-Lead Test Sets and CIH3021 lead set drawing (these open in a new window). 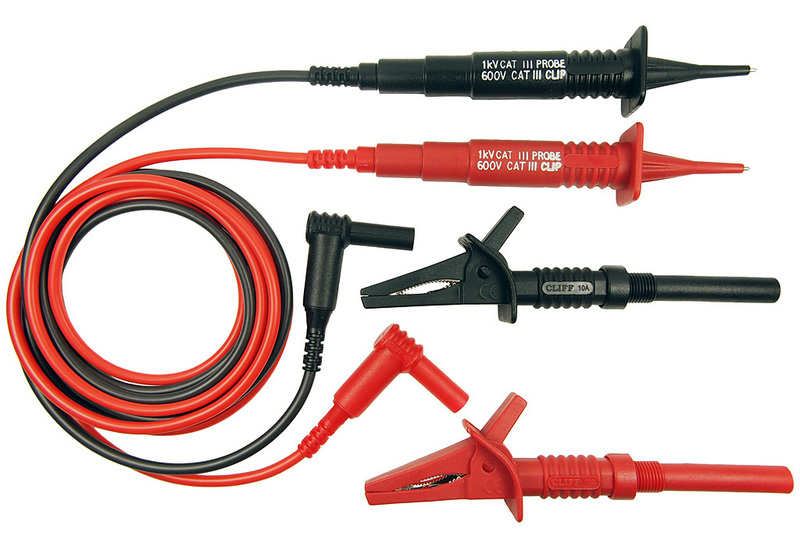 CIH3022 Three Lead Set: fused probes to 90° 4mm plugs including screw-fit crocodile clips. Red / Blue / Green . 1 x blue screw-fit crocodile clip. See the PDF data sheet: Three-Lead and Two-Lead Test Sets and CIH3022 lead set drawing (these open in a new window). 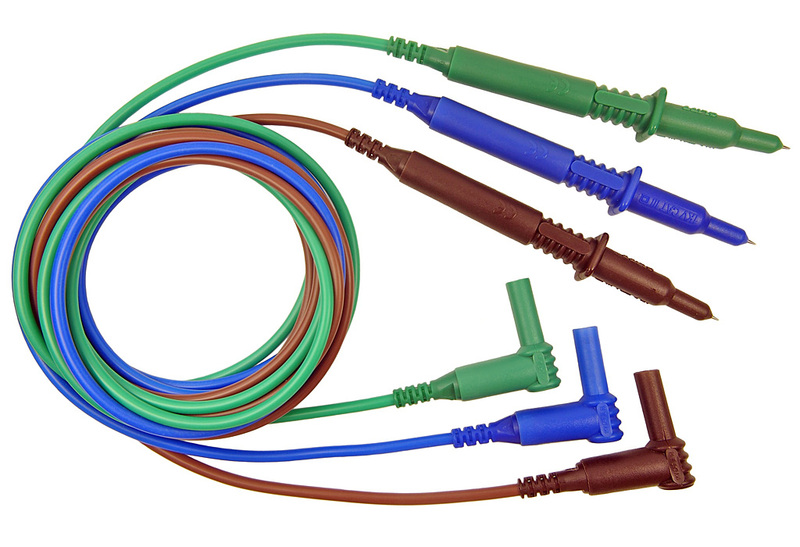 CIH3006 Two Lead Set: fused probes to 90° 4mm plugs. Fused: 500mA FF, 1kV HBC 50kA. See the PDF data sheet: Three-Lead and Two-Lead Test Sets and CIH3006 lead set drawing (these open in a new window). CIH3007 Two Lead Set: fused probes to 90° 4mm plugs including screw-fit crocodile clips. See the PDF data sheet: Three-Lead and Two-Lead Test Sets and CIH3007 lead set drawing (these open in a new window). CIH29890 Two Lead Set: unfused probes to 90° 4mm plugs including CAT III probe adapters and push-fit crocodile clips. 1.5m silicone cable. CIH29892 As above but with a 1.2m cable. 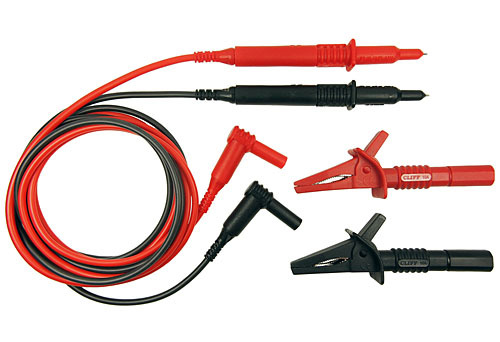 CIH29900 Two Lead Set: unfused probes to 90° 4mm plugs including CAT III probe adapters and push-fit crocodile clips. 1.2m silicone cable. TPR1 unfused probe. See the PDF data sheet: Three-Lead and Two-Lead Test Sets , CIH29890 lead set drawing and CIH29892 lead set drawing (these open in a new window).